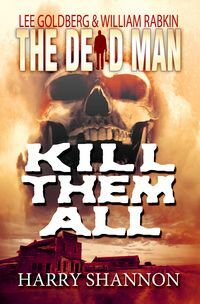 Kill Them All l by Harry Shannon keeps Matt Cahill, the hero of the Dead Man series, in the southwest. Harry Shannon, who has written many horror and thriller novels, does his best with this episode. He’s out-done himself by creating some very memorable bad guys. And the mysterious Men In Black following in Matt’s wake are given an identity. This is the shortest of Dead Man episodes so far, weighing in at 66 pages. The book begins with Matt Cahill making a hero of himself at the isolated town of Dry Wells, Nevada. He’s still on the trail of his enemy, Mr. Dark. 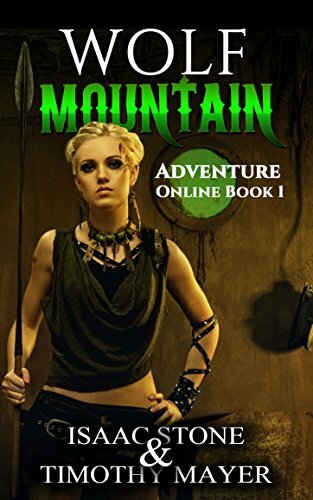 But while saving a girl trapped in an abandoned mine, Matt becomes a local celebrity. Next he trounces two of the local toughs getting fresh with a waitress. It’s a strange little town, trying to attract a vanishing tourist trade. Most of the younger inhabitants have left to find better job prospects. The mysterious MIB’s turn out to be a team of mercenaries who have been hired by an equally mysterious university to capture Matt by any means necessary. They don’t want him alive, just his blood and organs. With Matt gone they will have everything they need to find out why someone could survive being buried alive under ice and snow for three months. And with Matt dead, they will have the only known specimen. Matt awakes to find himself strapped to a table while the merc’s are pumping out his blood. The ring leader of the team, Scotty, babbles on about old movies and sports. The rest of the merc’s sit around sullen or smoke pot. It’s a grim crew which gives Mr. Dark competition. Naturally, Matt, with his unique ability to view evil, sees the lot of them as having the faces of corpses. The town folk manage to rescue Matt. But the merc’s survive and there’s a handy forest fire which isolates Dry Wells from the rest of the state. And the phone lines are out. Matt has a few brief hours to organize the town into a militia to stop the marauding killers. He knows they’ll be coming for and will burn the town to get him. It’s and old scenario. Will the 7 Samurai stop the bandits from destroying the village? Does Charles Bronson save the day? But Shannon does a good and believable job. Not everyone is built to stand tall against the forces of evil. And at the conclusion, Matt wonders if this was his reason for existence.